Defraggler has two different modes for defragmentation: regular defrag and Quick Defrag. Quick Defrag is faster, but the results aren't as optimal as with a regular defrag. Quick Defrag works faster by skipping over files that have certain properties. These are specified in the Quick Defrag tab of the Options dialog box. In the Options dialog box, click the Quick Defrag tab. To run Defraggler with the default Quick Defrag rules (see below), select Default rules. 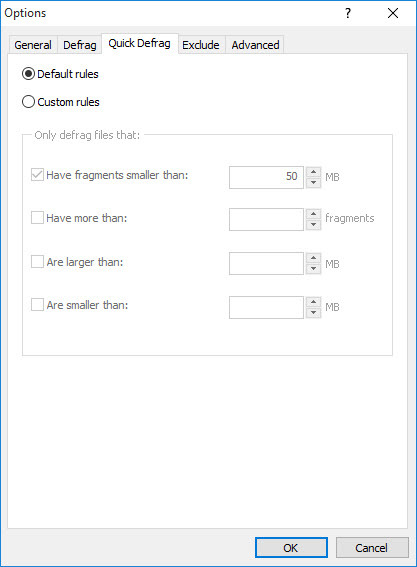 To set your own rules for Quick Defrag, select Custom rules, and then choose settings as follows. Have fragments smaller than X MB If selected, during a Quick Defrag Defraggler will only defrag a file if it has fragments smaller than X MB in size. Have more than X fragments If selected, during a Quick Defrag Defraggler will only defrag a file if it has more than X fragments. Are larger than X MB If selected, during a Quick Defrag Defraggler will only defrag a file if it is larger than X MB in size. Are smaller than X MB If selected, during a Quick Defrag Defraggler will only defrag a file if it is smaller than X MB in size. The default Quick Defrag rule is to skip files with fragments larger than 50MB. Note: To reset Defraggler's Quick Defrag rules, simply select Default rules.